Luna is a 1 year old female Cross-Breed. Luna was rescued in Cyprus and is now living in Doncaster. Through no fault of her own, this stunning girl is now looking for a new forever home. Here is a little about her: Luna can be calm and playful, as she is still a young girl, full of life and fun. 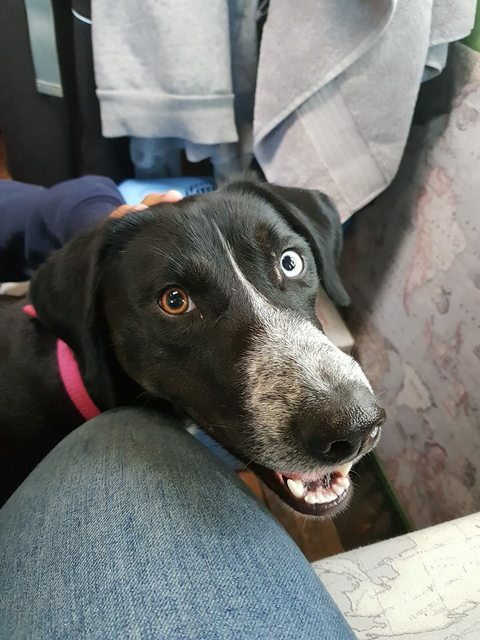 Whilst we do not know the exact breeds in her mix, her distinctive blue eye suggests possibly a touch of husky and her gorgeous shape suggests possibly a hint of pointer. But what we can say is that she is 100% adorable. She loves other dogs, she loves being with a pack and wants to play with all dogs big and small even if they don’t want to play with her! She currently shares her home with her brother and loves playtime with him. 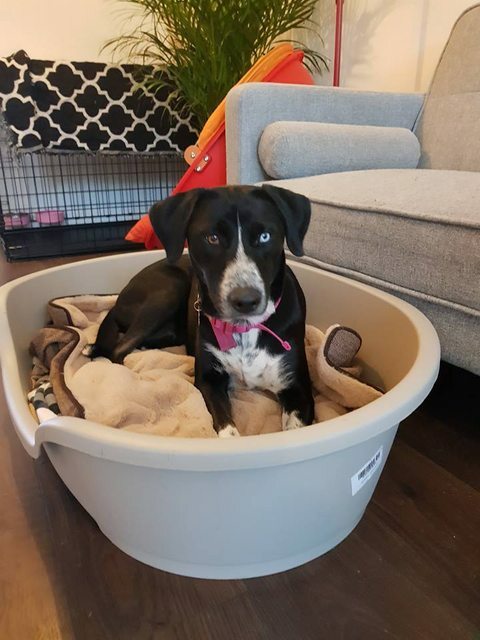 She would be happy to share with another dog in her new home, either with similar energy levels or she may be equally happy with a calmer older dog to learn from and help keep her energy levels met by playing occasionally. After enjoying her walks or playtime with the other dog in her home she is a real snuggle buddy, enjoying cuddles with her human. She loves kids and people and is very friendly but still at the bouncy, young dog stage so older confident children would be best. She has a wonderful temperament and her enthusiasm for life shines through. She is a typical squirrel obsessed dog but not in a harmful way and she has chased the cat. However, there are moments of her remaining calm and listening so the cat can move freely around the house, so with careful introductions and a dog savvy cat, she may be able to share her home with one. 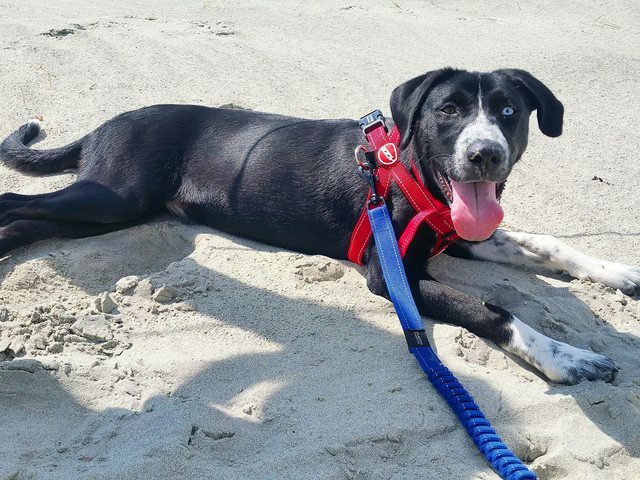 Luna is housetrained and sleeps well through the night in her own bed in the same room as her humans. Luna is looking for a home with a good sized, safe garden to play in and a human or two to enjoy long walks with. 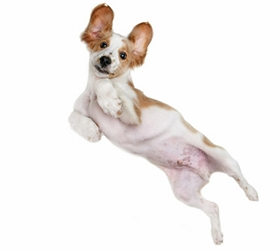 Humans who are about much of the day or have access to good doggy daycare facilities and can give her lots of love, attention and training would be preferable. She’s very intelligent so learns super quick but also sometimes stubborn as many dogs her age are, so requires daily training and a consistent routine. Luna thrives as the focus and heart of her family, and is the most beautiful doggo inside and out. She’s a very much loved, young dog. 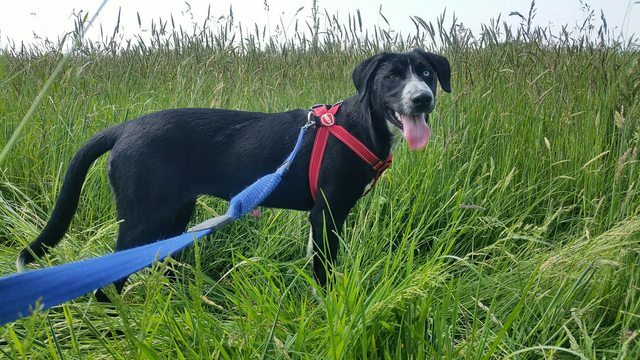 She is hoping for a new family to continue with the right support and kind handling, as any dog would require upon joining your household, and this will help her continue to develop into the fabulous family pet, she has the potential to be. If you are interested in the gorgeous, sweet, girl, with her distinctive eyes please contact us. We have no doubt that she will make her forever family very happy. She has been neutered, vaccinated and microchipped. The minimum adoption donation for Luna is £275. ADOPTION IS SUBJECT TO HOME CHECK. Full post adoption support is offered by our charity.